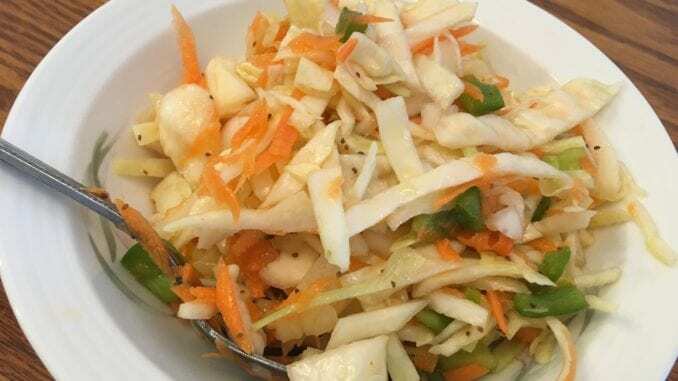 A coleslaw that Taunte Helen brought over from the old country in the 1920s and continues to serve at potlucks and family gatherings has been declared a ‘National Historic Site’ by the government of Canada. Taunte Helen says she occasionally adds a bit of vinegar to keep it fresh, but otherwise it’s the very same batch that her mother made in Molotschna. The coleslaw is one of only a handful of nationally-recognized Mennonite historic sites in Canada and now sits of the list alongside the likes of Neubergthal and the Schneider Haus. Taunte Helen also boasts a collection of dairy products in her refrigerator that are well past the expiry date. Mrs. Reimer Still Refers to Mrs. Ens as a "Russlander"